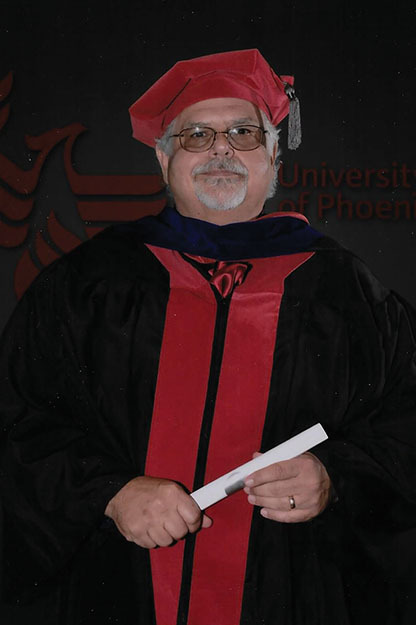 Central Tech’s Practical Nursing District Coordinator Curtis Baker recently earned his Doctor of Philosophy in Nursing from the University of Phoenix making him officially Dr. Baker. He was hooded at Rose State College on July 23. Dr. Baker has been a registered nurse for 20 years and worked at Central Tech for 14 of those years and has been the district coordinator for the past seven. Central Tech is proud of Dr. Baker and congratulates him for obtaining this prestigious degree. Curtis Baker recognized for earning his Doctor of Philosophy in Nursing.